Using Multikraft products in composting can almost entirely eliminate bad odours (H2S, NH4, etc.) and can considerably reduce the work required during composting. Adding the products to the compost heap also makes it easier to break down and compost difficult materials (fats, oils, sewage, etc.). Compost from biological waste or sewage compost can be produced using this method in just 6-8 weeks, without odour and with minimal turning. The treatment is used to speed up fermentation and humification. After 6-8 weeks and just 4 turning processes, the high-quality, nutrient-rich compost is ready. When building the heap, add eMB Active evenly to the compost material, adding an extra 0.1 L of eMB Starter per m³ for difficult to compost materials such as calcium. Before the microorganisms are introduced, the heap should have an optimum C : N ratio (1 : 15-30) for composting and an optimum moisture content of 35-50 %. Allow to rest for at least 3 weeks, protected from rain. During this time, it must not be turned or ventilated. If the heap is too moist (heap runs off), it should be turned to reduce moisture. 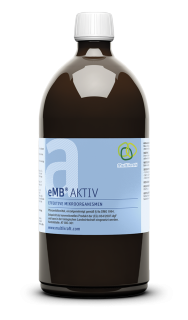 To speed up humification after the fermentation phase, turn once a week and spray with eMB Active at the same time. After 6-8 weeks and only 4 turning processes the organic compost is ready.